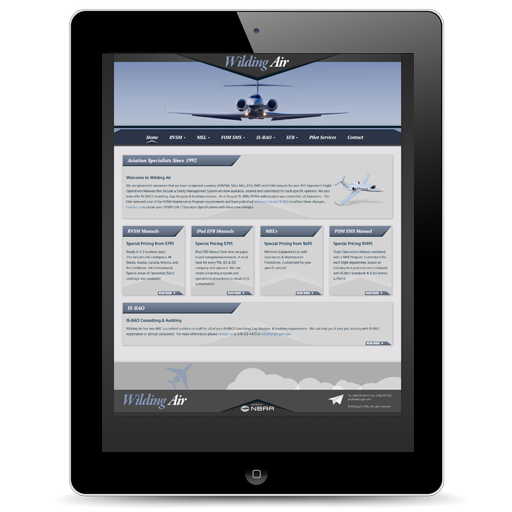 Wilding Air offers iPad EFB manual preparation services. An Electronic Flight Bag (EFB) is a device that allows flight crews to perform a variety of functions that were traditionally accomplished by using paper documents. In its simplest form, an EFB can perform basic flight planning calculations and display a variety of digital documentation, including navigational charts, operations manuals, and aircraft checklists. Utilizing an Electronic Flight Bag (EFB) can save storage space within the aircraft, reduce weight for the aircraft, and save time without the need to manually update physical paper navigational charts and procedures. EFBs can also potentially increase safety and reduce pilot workload. 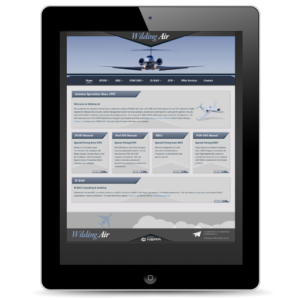 Before using an iPad as an EFB, when operating under 14 CFR 91K, 121, 125, or 135, authorization must be received from the principal inspector. The procedures for obtaining this approval are contained in FAA Order 8900.1 and FAA AC 120-76D. Op Spec/MSpec paragraph A061 authorizes the use of the iPad or any similar EFB device. At the end of a successful evaluation period, the Operator will receive authorization to use the iPad in lieu of certain paper documents. Wilding Air can help you do this using an iPad as an Electronic Flight Bag (EFB). We can create a training program and operational procedures to utilize the EFB in compliance with FAA guidance. For more information contact us at 248-212-4473.